The federal government is seeking consent from the City of Vancouver to add a significant office space expansion to Sinclair Centre in downtown Vancouver. 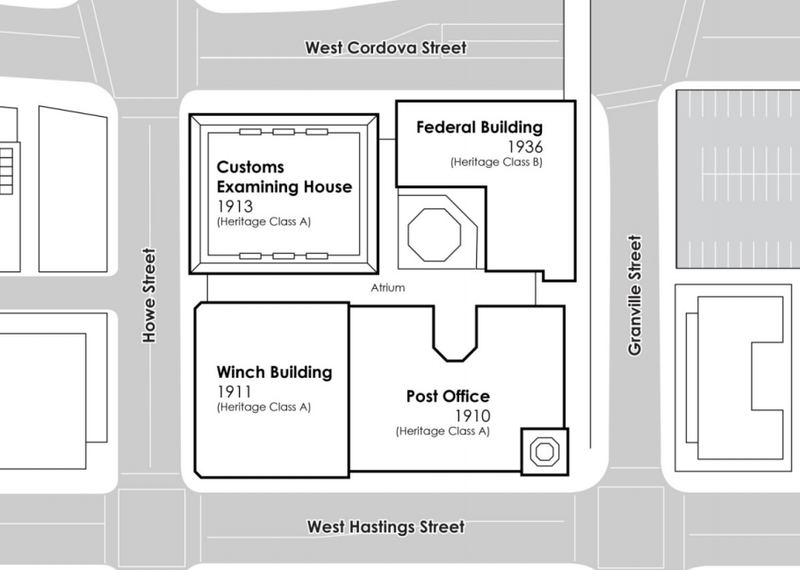 A report will be presented to Vancouver City Council next week to consider Public Works and Government Services Canada’s request to build an office tower expansion on top of the historic post office complex, which is owned by the federal government. Sinclair Centre occupies an entire city block, bordered by Hastings, Howe, West Cordova and Granville streets, near Canada Place and the Waterfront Station transit hub. The site consists of four mid-rise buildings constructed between 1910 and 1936, and the last major renovation it received was in 1986 when skylights, atrium space and a galleria were built in the spaces between the buildings. According to the report, the redevelopment proposal for Sinclair Centre is part of the federal government’s vision to consolidate its Vancouver offices and staff within one hub. The plan would add 1.1 million square feet of office space to the Sinclair Centre city block – up from the 390,000 square feet of floor space found within the existing configuration. The proposal would push the floor square ratio (FSR) to 17 to 20 FSR to become one of the densest new developments in the city. The report also notes that an office tower built as an addition to the heritage buildings would follow the City’s restrictions on height stipulated by the view corridor policy. This gives the proposed project a maximum height of no more than 350 feet (106.7 metres) or about 29 storeys. Considering its central location within the Central Business District and close proximity to a cluster of transit services, Sinclair Centre is relatively underutilized as it sees little foot traffic: the building has a few retail units and the upper floors are occupied by mainly service-based federal government offices. A redevelopment could provide the historic buildings with much-needed seismic upgrades and heritage retention improvements. “[Recently], Council has passed policy to intensify commercial uses in this area of the Central Business District (Metro Core Policy) and to increase employment near rapid transit to advance our transportation and sustainability objectives (Transportation 2040),” the report states. If City Council approves the federal government’s rezoning request for additional density, the federal government will begin work on a possible design for the site. There is some precedent in Vancouver for the incorporation of heritage buildings within new office developments. The 10-storey, 1929-built Old Stock Exchange building located one block away at Howe and West Pender streets is currently receiving a 21 storey vertical expansion to increase the building’s height to 31 storeys and office floor area to 369,000 square feet. Map of the Sinclair Centre city block. New office floors are being added to the Old Stock Exchange building at 475 Howe Street to give the site a new height of 31 storeys.